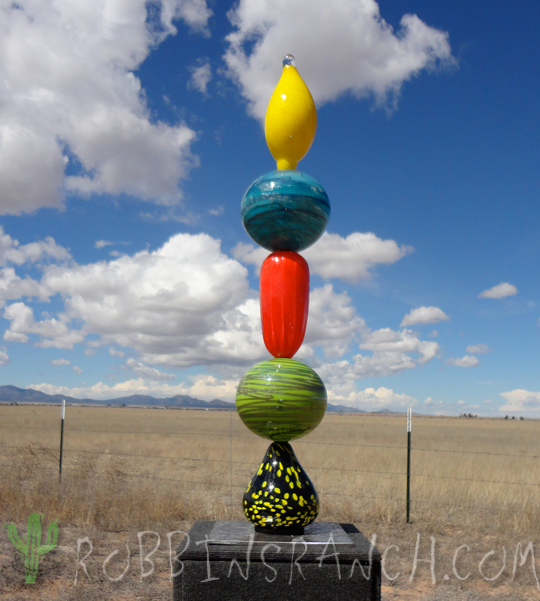 Sculptures range between 46″ to 56″ tall. These are the latest and greatest in totem yard sculptures. 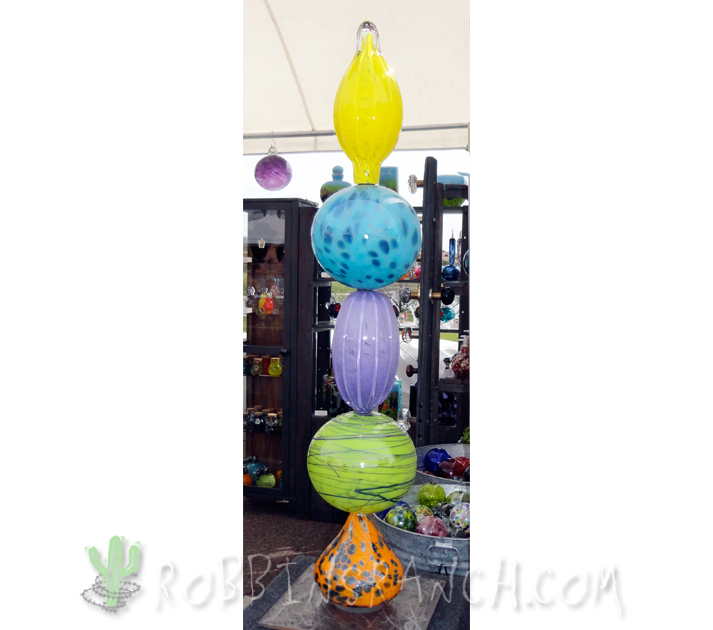 Hand blown glass shapes that will light up a room with unique, fun, colorful designs. 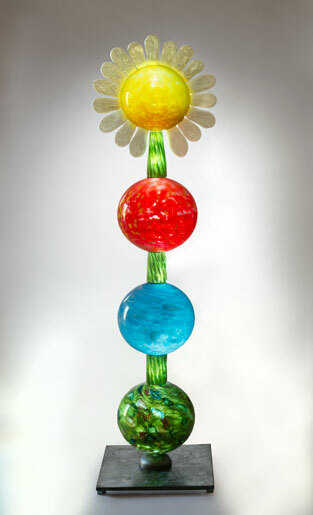 We create all the glass elements in our hot shop, blowing hollow forms that can be stacked. The glass pieces are made very thick, so you can be confident they can be placed outside and will withstand the wind and weather. After the glass has cooled, it is cold worked, polished and drilled down the center. A steel rod is threaded and attached to a 12″ x 12″ solid steel plate creating a very stable base for all of the parts to be stacked on. At this time any additional metal elements are fabricated to work in conjunction with the blown parts. With some experimenting, playing with all the shapes, and time stacking the pieces, we arrive at a final design. Once we establish the order of the glass, we then add LED light tape along the steel rod and secure it to the pipe. 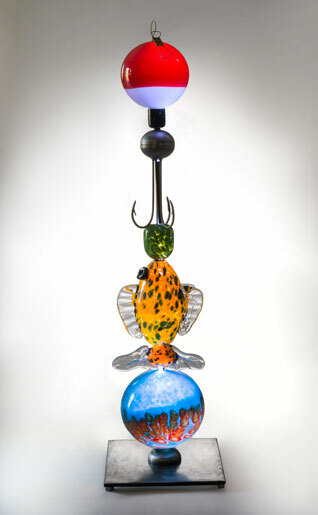 This lighting allows the glass to glow at night and be the most interesting version of itself. The totem yard sculptures are now ready to display. 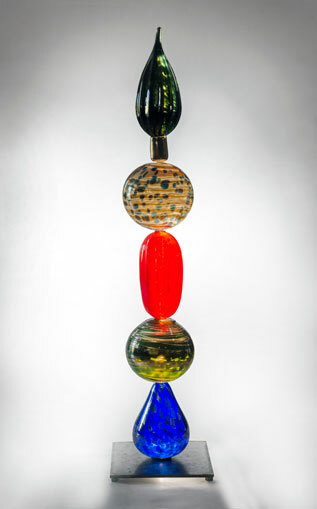 We are really enjoying this opportunity to make some larger, more abstract pieces combining the blown glass with fabricated metals.